Mid-Life Cruising!!! : Shiny, Happy People! Like one of my favorite R.E.M. songs .. we're "Shiny, Happy People" with our shiny, new plumbing on Nirvana! After removing all of the old, moldy plumbing hoses and painting the storage areas, we finally have running water again on Nirvana! 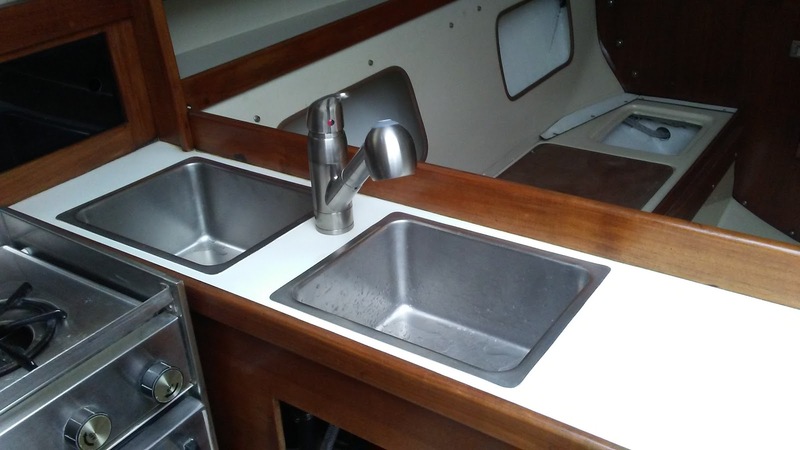 After a good cleaning with Barkeeper's Friend, we decided to keep the original galley sinks and just buy a new faucet. It's a bit larger than the ideal size for the sinks, but being from Home Depot .. it was a lot cheaper than a "marine" faucet! The above photo in this post shows the finished installation. We're happy! Like all of our projects on Nirvana, replacing the plumbing wasn't as quick n easy as it sounds! Pulling n tugging new hoses through holes and underneath settees & cabinets ain't no joke. Hoses to & from the two water tanks, hoses to & from the head, hoses to & from the galley, a vent hose from each water tank, and another from the holding tank .. and they all needed new clamps and screws. Why is it that all of our old stainless steel clamps didn't have stainless screws?! Then there was all those little plastic pieces/parts needed to attach the tiny sink drains to the hose .. elbows, tees, bushings ... I learned all sorts of new words! But, it was all figured out after many trips to the hardware store. 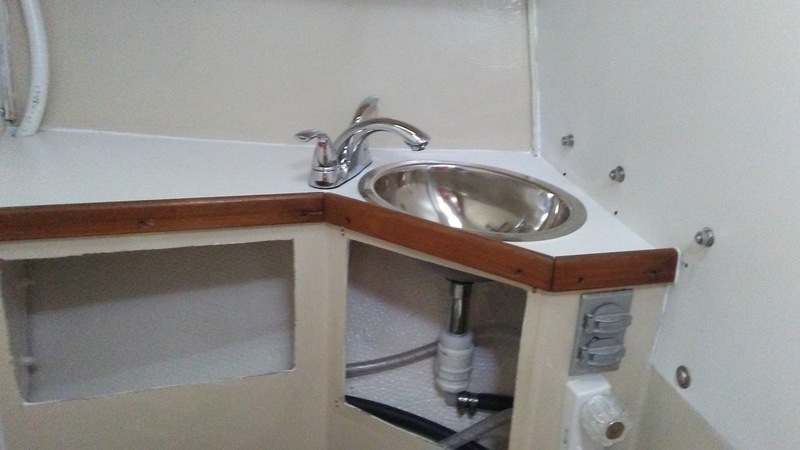 The picture below is a bit blurry, but see all those plastic fittings from the galley sink .. x 2. 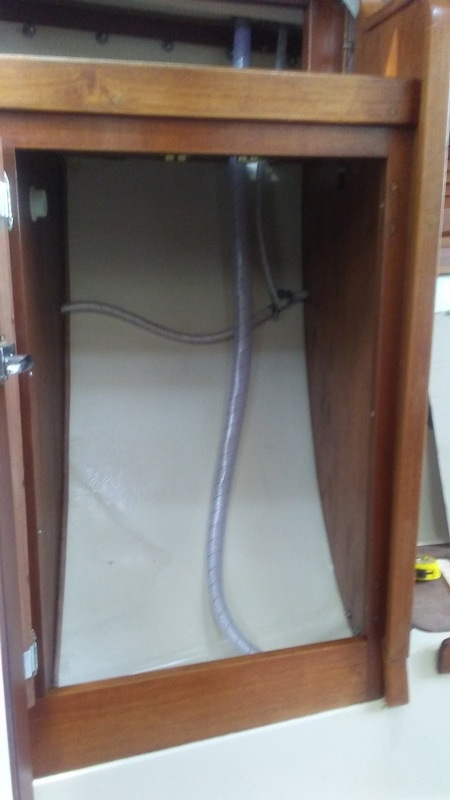 We used heater hose for the drainage hoses, and will eventually install a water filter in this under-sink cabinet. Here's a photo of our shiny, new faucet & sink in the head .. and what's goin' on underneath (more fittings!). We found a great deal on the oval sink from Go2Marine. We bought it during a Christmas sale and with a coupon ... getting it for $26 bucks! Considering how funky the old sink was (Barkeeper's Friend just wasn't enough) and the cheap price on the sink .. this was money well spent! Who wants a funky sink in their bathroom?! The faucet came from Home Depot ... again, meant for a house but a lot cheaper than a "marine" faucet. Notice the vent hose coming out of the left corner of the counter? This is from the holding tank (under the port salon settee) and goes up into the storage cabinet & out of the stanchion on the deck. We used spa hose for this. See those knobs underneath the electric outlet (yeah, we know electricity near the sink isn't safe and we need to address this) .. Ken added that with a shower hose/head for those rare times we actually shower inside the boat. Here's a photo below of the hoses (we made sure they were potable!) in our storage closet that add water from two deck fill locations to the two water tanks & a vent hose that runs from each tank up to the deck and out of a stanchion. One water tank is forward of this closet in the v-berth and the other is aft of this closet under the starboard settee. 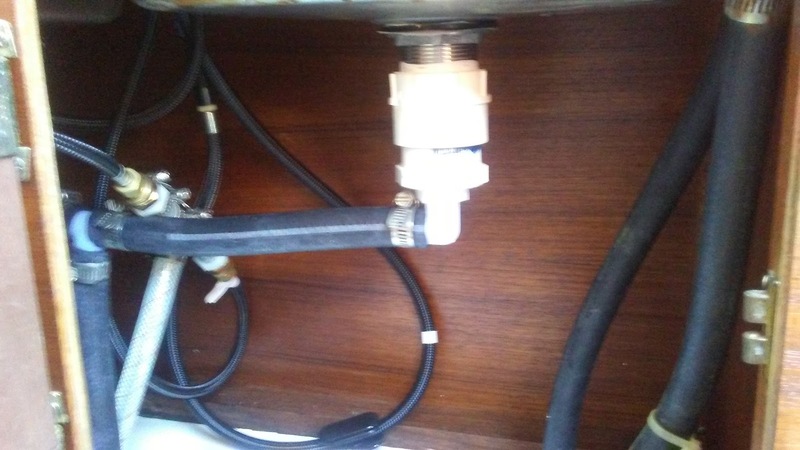 (The second hose from deck to v-berth water tank is not in this photo .. and is located on the left behind the cabinet drawer). For those not familiar with boat plumbing .. do ya see why it's not as easy as it sounds? So many parts and tight places. I swear, building a house is much easier! While thinking of those water deck fills .. we had to buy new plastic covers for them. Am I the only one that thinks $50 bucks for two pieces of plastic is crazy?! I think Catalina Direct got us on this one, and I found some cheaper ones but Ken said they wouldn't work? I don't know .. but we need to make sure these are secured and don't go overboard! Oh, and the bronze fill pieces in the deck were a bit green, so I used a tip that I learned from "Women Who Sail" .. ketchup! The acid in the ketchup eats away at the grime .. just let sit about an hour then scrub with a toothbrush and rinse. It really works! During all of this, our old water pump was leaking so it was replaced with a new Shur-Flo water pump (#86-8398) from PPL Motor Homes. We also got this on sale for $55.99 .. good deal! A lot of stuff for a boat can be found at an RV store for a lot less money. We kept our original water pump in case we can fix it when we have time. Maybe it would make a good spare. The macerator pump was also repaired during this project with a new impeller & gasket from West Marine for $41.69. We've since found this repair kit for $26.36 at CE Showroom .. good to know for spares. We were happy with this fix .. better than over $100 bucks for a new pump! Also .. anything with a holding tank or macerator is dreaded ... but it really wasn't that bad. The macerator pump is located a bit higher than the holding tank, so there wasn't much of a mess. Whew .. there wasn't much "pugh"! With clean water tanks and plumbing, this was exciting stuff to us. Only other boaters could understand my excitement about new hoses n stuff, right! Since this project, we've installed the refinished teak cabinet drawers & doors that have been waiting for this plumbing project to be finished ... I was giddy! Also, in addition to the storage shelves that Ken just completed, he also created a new cabinet in the head for the new storage area (hole he cut) behind the toilet. Stay tuned for a post with photos .. Nirvana keeps looking better! Upcoming projects are installing new interior LED lights that we purchased and bringing home our cushions for cleaning and re-covering. Nirvana is close to looking like a home! Incredibly great job, Ken & Cheryl! I know exactly how much work, blood, sweat, and tears goes into these kinds of repairs/redos. Y'all are really making Nirvana into an excellent home. That looks awesome! And boy, do I know how nice it is to be on the tail end of that kind of refit. You got a great deal on that bathroom sink, too. Looking good! You're great at hunting out good deals. Everything looks great! Did you plumb for a keg?